Tachypnea is the medical term for an increase in the rate of respiration (breathing). The normal respiratory rate is between 12 to 20 for adults. Anything over 20 breaths per minute is called tachypnea. Also known as rapid breathing, tachypnea is common in people who have emphysema, either because they are not getting enough oxygen or they are trying to "blow off" excess carbon dioxide (a waste product of metabolism), which has built up in their blood due to an inadequate expulsion of inhaled air. In addition to COPD being responsible for a low oxygen or an elevated carbon dioxide level, there are other mechanisms by which people with COPD may develop tachypnea. For example, fevers related to lung infections may cause tachypnea. Heart damage such as congestive heart failure, as well as anemia can also contribute to rapid breathing, as can anxiety related to dyspnea – being anxious about getting a good breath and releasing it. It can help to define a few terms to better understand tachypnea. Whereas tachypnea refers to rapid shallow breathing, hyperpnea stands for both rapid and deep breathing and occurs during moderate exercise. Dyspnea refers to the sensation of shortness of breath. With dyspnea, the breathing rate may be rapid, slow, or normal, and the depth of breathing may be shallow, deep, or normal. Hyperventilation is rapid deep breathing, but in contrast to hyperpnea, it does not have a physiological function in the body. It actually makes the acid-base balance in the body worse. Tachypnea is common with all forms of COPD and, along with dyspnea, is a common symptom of COPD exacerbations. Forms of COPD in which tachypnea is common include chronic bronchitis, emphysema, and bronchiectasis. A very important distinction to note with tachypnea in COPD is whether or not it is physiological versus pathological. Those are large words, but the concept is easy to understand. Physiological means that the tachypnea has a purpose. So by taking rapid shallow breaths, the body is correcting other abnormalities. In this case, it's important to treat the underlying cause, as treating the tachypnea alone could actually be harmful. In contrast, pathological tachypnea occurs when a person develops rapid, shallow breathing which may be harmful to the body. Treatment of tachypnea with COPD depends upon treating the underlying cause of the disorder, and if it is physiological or pathological. 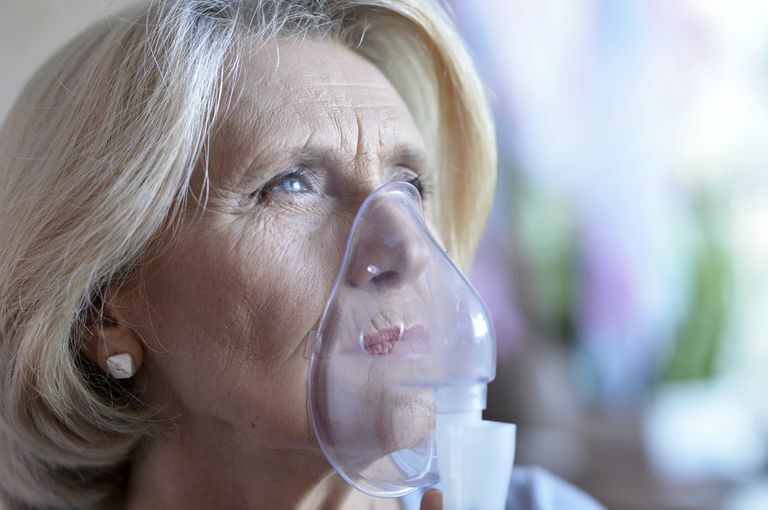 Therapy may include inhalers such as bronchodilators to open the airways allowing oxygen to better get to the alveoli and carbon dioxide be more easily exhaled. Steroids can decrease inflammation in the airways helping with both of these processes as well. If medications alone are unable to restore oxygen levels to normal in the body, oxygen therapy may be needed. Tachypnea with COPD may also be due to infections. Lung infections may cause a fever, which in turn causes physiological tachypnea. The therapy for this would be treating the infection rather than directly addressing the tachypnea. If tachypnea is pathological—in other words, if rapid shallow breathing does not work to restore the oxygen/carbon dioxide levels and acid-base balance of the body—then treatment looking specifically at tachypnea may be tried. An example would be with hyperventilation due to anxiety. Rather than improve the oxygen/carbon dioxide levels and acid-base balance of the blood, hyperventilation can make these worse. In this case, treating anxiety, for example, with relaxation breathing, guided imagery, or meditation, may be the best treatment. Anxiety is very common in people with COPD, and this can contribute further to abnormalities caused by the lung disease. Han, MK. (March 2016). Patient education: Chronic obstructive pulmonary disease (COPD), including emphysema. (Beyond the Basics). In: UpToDate, Stoller JK (Ed), UpToDate, Waltham, MA. Schwartzstein RM, Richards J, Edlow JA. (February 2017).Hyperventilation syndrome. In: UpToDate, Aronson MD, Hockberger RS (Eds), UpToDate, Waltham, MA.